It’s no surprise that the tower defense genre is one of the more popular game categories among iPhone and iPod touch users. The iPhone’s touch screen and beautiful display make it the perfect platform for games such as Fieldrunners, GeoDefense, and many more. Add Defender Chronicles from Chillingo to the list. The game has all the core elements that make for a great tower defense title, offering a role-playing game twist. Defend Your Tower: In Defender Chronicles, your enemies march along a predetermined path that zig-zags its way from left to right. Your job? Stop them. Defender Chronicles is a fixed-path tower defense game in which the enemies travel along a predetermined path bent on the destruction of your castle. If too many enemies pass through your castle gates, the level ends in defeat. To stop the ensuing hordes of baddies. you build guild houses (towers) to train either soldiers, archers, or mages. The places you can set up your defenses are also predetermined by flags scattered along the pathway. Choosing where to place the different troops is critical to your success. Archers, for instance, do better in the middle of the screen where the enemy is more often in range of their arrows. Aside from strategic placement, deciding witch type of troops to use is also important since different enemies are resistant to certain attacks. Orcs, for example, are barely damaged by arrows, so simply deploying loads of archers isn’t going to work. Defender Chronicles has a side-on view like a platform game. The path you must defend zig-zags its way from left to right on an incline like Donkey Kong. At the top (or bottom) of the screen is your castle and its last line of defense—your hero. As you defeat levels, your hero gains experience and points that can be allocated to his different skills. Some skills affect just the hero while others also beef up the troops he leads. Each level lets you select varying degrees of difficulty—the higher the difficulty, the more experience you gain. You also get tokens you can use to buy armor from the trade shop or artifacts from the library which unlock all kinds of goodies like new levels, different upgrades, and other extras. If you find yourself unable to beat a certain level, you can always go back to an earlier stage and beat it at a higher difficulty setting to gain more experience. Greatly adding to the game’s replay value are five different game modes—Classic, Classic Extended, Freestyle, Extended, and Endless. These different modes range from the original game to versions where you survive as long as you can against wave after wave of hordes, either with or without your hero and his artifacts. In the Freestyle mode you defend against randomly generated hordes so that each time you play it’s unique. There are five different unlockable levels on the map and one that’s available to purchase from the library. The touch controls in Defender Chronicles are simple and effective. Just tap a flag on the path to select it, and buttons appear on the lower right side of the screen to choose the type of guild you want to build. You can upgrade or sell existing guilds the same way. The standard pinch gestures are supported for zooming in and out, as is dragging a finger to pan around the scene. Defender Chronicles’ medieval cartoon-style graphics are a nice fit to the game and look great, especially when fully zoomed in. Even with all the insane action taking place on-screen, the game ran silky smooth. The music is great, and there’s even the option to listen to your own songs. Sprinkled throughout the game are some character voice-overs adding to the game’s overall polish. 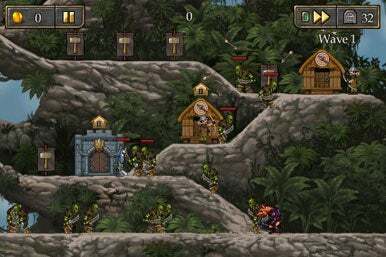 Defender Chronicles is an excellent tower defense game that stands out from the crowd with its RPG elements, great graphics, and challenging strategy.